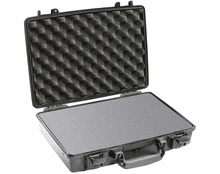 Pelican® 1490 Black Attache/Computer Case Like all Pelican® Protector™ Equipment Cases, the #1490 Computer Case is watertight, dust proof, crush proof, and corrosion proof. 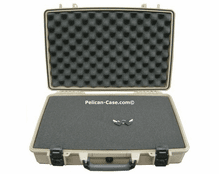 The #1490 Case is molded of advanced ultra high impact copolymer resin, protects valuable laptop computers from handling abuse and all weather conditions. Includes fold down handle.